The Scottish Business Pledge was created in 2015, the same year the Scottish Government committed to the UN’s Sustainable Development Goals. In launching the Pledge, the Scottish Government’s stated aim was to create a partnership with businesses who shared the ambition of “boosting productivity, creating sustainable employment and workforce development”. In 2018, the Government reviewed the Pledge. 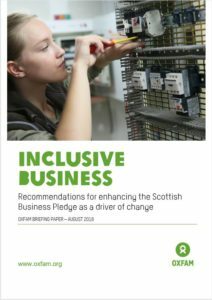 This policy briefing, published by Oxfam Scotland on the back of a UWS-Oxfam Partnership Policy Forum in June 2018, urges the Government to strengthen the Business Pledge in particular with a view to driving forward the Scottish ‘Fair Work’ agenda and enhancing the role of business in supporting sustainable development at home and abroad. For too many Scots, the existing economic model is failing. Far from improving their lives, it traps them in a cycle of economic hardship. Yet it is possible to overcome poverty, both in Scotland and across the UK – many of the solutions already exist, hidden within the very communities hit hardest by an economic model that worships at the altar of ‘economic growth’. This project, led by Katherine Trebeck and Francis Stuart of Oxfam Scotland, and supported by Chik Collins and Mike Danson from UWS, aimed at presenting evidence for how resources can be allocated in a more effective and sustainable way to deliver lasting change. This series of papers resulted from the ‘Whose Economy?’ seminar series held around Scotland in 2010 – 2011. The purpose of the seminar series was to provide a space for researchers, representative organisations, policy-makers and people with experience of poverty to come together and explore the causes of poverty and inequality in today’s Scotland. The document includes the following papers: “Whose Economy? An introduction” by Mike Danson and Katherine Trebeck; “Whose Welfare State Now?” by Adrian Sinfield; “The Scottish Economy” by Stephen Boyd; “Desperately Seeking Poverty (Alleviation): towards poverty sensitive budgeting in local government” by John H McKendrick; “Rethinking Good and Bad Jobs in Glasgow” by Chris Warhurst; “Health Inequalities in Scotland: Looking beyond the blame game” by Gerry McCartney and Chik Collins; “Wellbeing, Consumer Culture and the ‘New Poor’” by Sandra Carlisle and Phil Hanlon; “Stigmatising Poverty? The ‘Broken Society’ and reflections on anti-welfarism in the UK today” by Gerry Mooney; “Housing, Class and Regeneration: exploring the ‘new’ inequalities” by Kirsteen Paton; “The Experience of Poverty in an Unequal Society” by Sarah Welford; “To What Extent Does Poverty Explain Scotland’s Poor Health Profile?” by David Walsh; “Community Ownership Through Land Reform? A review of the Land Reform (Scotland) Act 2003” by Tim Braunholtz-Speight; “Can Public Services ‘Protect The Vulnerable’ in the Age of Austerity? Considering the evidence on street cleaning services in the age of growth” by Annette Hastings; and “Conclusion: Our Economy” by Mike Danson and Katherine Trebeck. This report was written in the early months of 2009 and offers a view on ‘welfare reform’ as it had developed in the preceding years from the perspective of the Clydebank Independent Resource Centre (CIRC). It was written at a crucial moment in the history of welfare in the UK. The Welfare Reform Bill which was at that time going through the UK Parliament had been described by the Social Security Advisory Committee (SSAC) as, “a major departure from the principles … that have underpinned UK social protection for almost 60 years”. The plan was to “shake up the benefit system”. The “architect” behind the plan was a former banker, David Freud. He is the banker referred to in the main title of the report. He is also the person to whom ‘the bankies’ (people from Clydebank) were at that stage addressing themselves – though of course they were simultaneously, and every bit as importantly, addressing themselves to the politicians who had appointed him as their key adviser. The report is a key example of the potential value of the kinds of collaboration around emerging and live developments, involving grass roots community organisations, Oxfam and UWS academic expertise, which subsequently led to the formation of the UWS-Oxfam Partnership. This book tells ‘the story’ of the Clydebank Independent Resource Centre (CIRC), from its origins in the form of a local Unemployed Action Group in the 1970s, through its later guises as Clydebank Unemployed Workers’ Centre and the Clybebank Unemployed Community Resource Centre, to its more recent transformation into the Clydebank Independent Resource Centre. The research on which the book is based was carried out because people working on Oxfam’s UK Poverty Programme in Scotland came to the view that the telling the Centre’s story could make an important contribution to the development of genuinely community-based responses to the experience of poverty in contemporary Scotland.